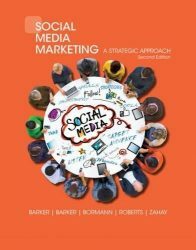 SOCIAL MEDIA MARKETING: A STRATEGIC APPROACH, 2E builds on the strength of the first edition, adding to the book’s real-world focus with practical examples and case histories woven throughout the text. You’ll find more explicit focus on the marketing use of popular social media platforms, including both those that are well established and those that are emerging. Conceptual frameworks and the explication of a social media marketing plan are illustrated using a strong example. This edition’s conceptual frameworks are strengthened with additional teaching concepts, and best practices are emphasized. The authors provide a variety of social media initiatives to help you keep up with the latest developments and enable you to weave current social media marketing campaigns and developments into your course. Prepare your students for today’s ever-changing world of social media marketing with this winning book and package that are easy for you to modify for your needs.